The Hoyer Group is strengthening its presence in Australia by creating the joint venture Hoyer Logistics Australia, which was founded together with AAW Global Logistics on 3 May 2018. The Hamburg logistics provider holds 51% of the shares, while the Melbourne-based partner holds 49%. By taking this step, the two companies will intensify their collaboration to enable further development of the logistics market on the Australian continent. The newly founded Melbourne-based company Hoyer Logistics Australia will concentrate on developing logistics services in the Australian domestic market. The portfolio of service provisions comprises of the transportation of chemical products, foodstuffs including wine, milk products and cryogenically liquefied gases. In addition, Hoyer Logistics Australia will also offer the rental of tank containers and IBCs. Furthermore, flexitank services will be provided as well as fleet management. Barry Misiurak, Managing Director of AAW Global Logistics, added: “The long-standing collaboration with Hoyer in the overseas business area has led to strong brand awareness in Australia. 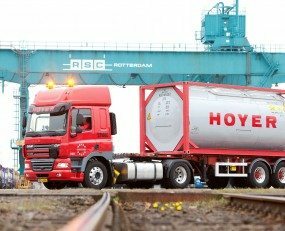 As part of Hoyer Logistics Australia, we look forward to enlarging the extensive range of domestic service provisions in the bulk logistics area.” The commercial management of Hoyer Logistics Australia will be undertaken by Stuart Eastaugh, who will combine it with his role as Commercial Director Hoyer Global Agency Australia. The AAW Global Logistics group of companies has operated in Australia for 35 years and has 200 employees working in ten offices. The group offers both national and international logistics.